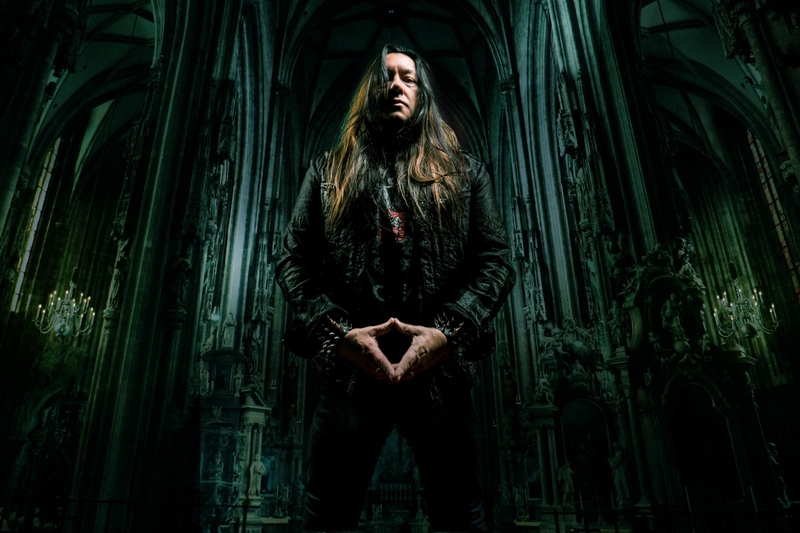 Testament guitarist Eric Peterson’s black metal project Dragonlord has been on the back burner for a while. They last released an album in 2005. He’s been working on Dominion for a few years, and is now being released. I chatted with Peterson about the Dragonlord album, whether they will play any live shows, the Slayer farewell shows, the status of Testament’s next album and more. Chad Bowar: Why was 2018 the year that was right for another Dragonlord album? Eric Peterson: because it was finally done! (laughs) My schedule has been just super crazy with Testament, as you know. We were always touring or making records and there was time in between, it just wasn’t enough time. There were a couple of hiccups that happened in the beginning that threw it all off, kind of like when your back goes out a little bit and then each day you do something and then you have an explosion at the end. Luckily through time though, every problem that I had, there was always some kind of reward for it. I had a story to tell. It was about a girl and it was about being summoned somewhere, but it wasn’t until she sang the end that I knew that I wanted to do a takeoff of Dante’s Inferno with Beatrice, but her actually staying in the underworld and falling in love with the prince of darkness. So all those little things, the hiccups, brought something killer to the table at the end of it. And since it is more of a project, and other than being a normal person and turning the record in on time, I was able to really paint the picture the way I really wanted it in the first place. Definitely with the sound of it in the course that I had to do it, it wouldn’t have sounded this good or came out this good if I had made it happen in the timely fashion that I was given. You had worked with Leah before, right? Yeah. I used to jam with her back in 2008, maybe a little bit earlier. I was working with a friend at Lionsgate on some Dragonlord video stuff that he was helping me with. Part of the deal was that I would hang out with jam with these guys and Leah was part of the jam entourage and she was a keyboard player and singer and I just kept in contact with her after that. Nothing ever transpired for that, but we were going to do something later together and since then she invited me to sing on her first record. When she first called me, I thought she wanted me to play guitar. She’s like, Hey, I want to get you on my record. And I’m like, oh yeah, cool, send me riff ideas. She said, no, vocals. So that came out pretty good. That was a lot of fun. I had her come out and redo the keyboard choir stuff. She was just going to do I think the title track and maybe the intro. And after she did those, I was pulling her hand before she left. Wait a minute, you’re not leaving yet. You’ve got to do the whole record now. Even though it sounds like choirs and stuff, she brought that human touch to it. There’s a difference between humans and choirs, even though if you’re using some of the bigger programs. There’s something about a real person doing it. It was really cool for her to do that. The advantage of having four years to record this is you have a lot of time to tweak and change things. And the negative thing about having four years is you have a lot of time to tweak and change things. I was pretty busy in between the time. One thing that was kind of weird was coming back to it and maybe not being on the same page of where I was at. And that was the problem with me lyrically. I just would come back and be like, what was I thinking? How can I sing over something like this? And that was the song “The Discord Of Melkor.” That music is just insane. When I wrote it, I remember I had an idea, but I never demoed it, so I forgot what I was thinking. But over time it came to me again. I was reading a book by Tolkien that he started and his son finished, The Silmarillion. It’s about the first stage of the Lord of the Rings. Melkor is one of the head angels and turns on everybody. So it’s kind of taken from the genesis, how Lucifer was an angel and when they were descended to earth, he became Satan. And then when Melkor descended to earth, he took the beings of Valinor, which are the elves and orcs and dragons. It’s really cool to see how Tolkien did that. So this song was perfect for that one because in the middle of the song there’s a orchestra part. I pictured the whole thing in fast motion, the creativity of these beings. That’s the vision I had and it was a lot of fun doing my version of it, which I would’ve never thought of until I read the book, which came later. When you’re recording vocals, which are more challenging, the harsh vocals or melodic singing? The harsh ones come out naturally. A lot of those just one takes. The singing I had to develop and learn. The first thing is I’m not a singer. I had to find myself through acting. The way I went about it was I went into character of telling the story, and that helped me to where I wasn’t thinking about actually singing. It just helped me think of telling the story in the right way that grabs you and through that, halfway through once I’m starting to put harmonies and stuff on it, I was actually thinking wow, this sounds like a singer. So I kind of tricked myself, I guess. How did you come to sign with Spinefarm Records? They approached one of my colleagues about looking into Testament and they had mentioned that Testament signed a deal with Nuclear Blast, but that I’m working on my new project Dragonlord, and would they be interested in that? That turned into a deal that way, which I really wasn’t even looking for, but it just fell on me and was like, oh cool. I’m doing as much as I can for it with the platforms I have to work with because Dragonlord is not a touring act and that’s what you need to do these days because there’s so many bands coming out. I’m also trying to work the angle of the comic world. I have a character from one of those songs, “Northlanders.” On the LP and the digipak there’s a booklet that is graphic novel style and each song has its own picture representing a moment in the song of the lyrics. One of them came out really, really good and we’ve dubbed him The Burner. And so through some of my comic friends, I ended up coming up with a storyboard and together with the new people that I’m working with, we bounced back and forth and came up with a storyboard. Then two, three, four days I have pages one, two and three penciled out and it just took off from there. So hopefully I’ll be able to use that as a platform to keep people interested in Dragonlord. I guess my ultimate goal would be animation with Dragonlord in it, but it has to do with The Burner more, who is a black metal time traveler hero from Planet X. The character is really cool. I mean, there’s never been a black metal superhero. You said that Dragonlord’s not a touring band. Would you ever consider doing a one off show, like playing an album in its entirety? I would imagine at some point I’m going to play some shows. That’s not off the counter, it’s just timing. My number one priority now is working on the new Testament record. I would definitely like to do something. Plus I’m kind of picky. I don’t want to just do a show for a show, though. I’d like to have some production and might have to throw in some of my own money and do it right. I wouldn’t want to do two weeks of shows and look like an opener. There’s too much into this to look like that. And being who I am, if I’m wearing corpse paint. I want a dragon behind me spitting fire. Have you noticed a difference in the Slayer farewell shows compared to the times you’ve played with them in the past? It’s the same trip but it’s a little bit more heartfelt, seeing it do so well then going, wow, this is it. But I guess that’s what makes it feel so special. There’s an energy they have. They’ve always been killer, but there’s something more killer about it now that I can’t pinpoint. I know a lot of it is playing arenas and having the production they have with the fire and the song selections all there. It’s just, damn! And they still look good and they play really good. They’re going out with a bang, in my opinion. Seeing one of your generation’s bands ready to hang it up, does that make you think about your own band’s mortality? I just feel like I’m a kid opening up for them so I don’t realize it until someone like you asks me. We’ve got a lot of room for us to do stuff still. I would imagine at some point, we’re going to do something like that. But I think we’ve got a couple records in us before we get there. Is the new record set to come out in 2019? Yeah. Tentatively if all goes well, I would like it to come out around June or July. So that means that the record’s got to be recorded by March. We’ve got a lot of work to do. I’m feeling pretty good though about the riffs and ideas I have so far. Do you find that working on your own stuff recharges you and gives you extra energy when you get back together with Testament? Yeah, especially after having this one done and out and listening to it. I’ve got a little confidence now. The last record I wrote like 95 percent of it, so I’m not really worried about having enough material. I feel pretty good about it.